(MENAFN - DailyFX) Japanese Yen Talking Points USD/JPY climbs to fresh yearly highs as U.S. lawmakers work arduously to avert another government shutdown , and the exchange rate may continue to carve higher highs & lows over the coming days as it breaks out of the range-bound price action from the previous week. 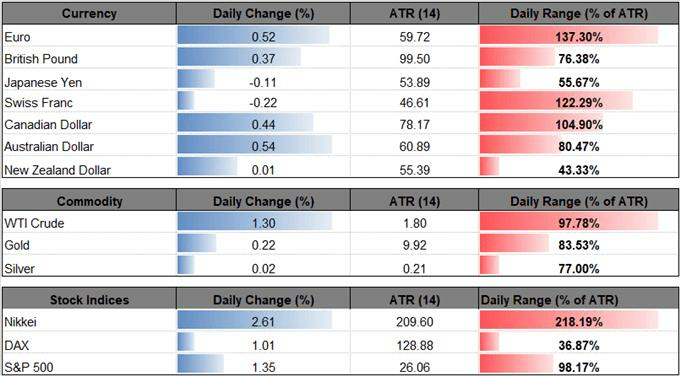 Post-NFP USD/JPY Rally Gathers Pace as U.S. Averts Another Shutdown The USD/JPY advance triggered by 304K expansion in U.S. Non-Farm Payrolls (NFP) appears to be gathering pace even though the Federal Open Market Committee (FOMC) drops the hawkish forward-guidance for monetary policy, and the current environment may continue to boost the appeal of the dollar as U.S. Treasury yields highlight a similar dynamic. Keep in mind, Fed Fund Futures still show the FOMC on hold throughout 2019 as the ‘the case for raising rates has weakened somewhat,' and a growing number of central bank officials appear to be making the case to conclude the hiking-cycle ahead of schedule as ‘inflation readings have been muted.' However, Chairman Jerome Powell & Co. may have a difficult time defending a wait-and-see approach as data prints coming out of the U.S. economy show little to no signs of an imminent recession. At the same time, the Atlanta Fed ‘GDPNow modelestimate for real GDP growth (seasonally adjusted annual rate) in the fourth quarter of 2018 is 2.7 percent on February 6, up from 2.5 percent on February 1,' and the scope for a more robust economy may boost the appeal of the U.S. dollar as it puts pressure on the FOMC to further normalize monetary policy in 2019. With that said, the USD/JPY flash crash rebound looks poised to persist as both price and the Relative Strength Index (RSI) track the bullish trends from earlier this year, and recent price action raises the risk for a further appreciation in the exchange rate as it carves a fresh series of higher highs & lows. Sign up and join DailyFX Currency Analyst David Song LIVE for an opportunity to discuss potential trade setups. Additional Trading Resources Are you looking to improve your trading approach? Review the ‘ Traits of a Successful Trader ' series on how to effectively use leverage along with other best practices that any trader can follow.